Rating: 7.2/10. From 108 votes. The Seecamp LWS .32 from the left. L.W. Seecamp, a family owned gun maker in business since 1973, produces a line of semiauto pocket pistols chambered in .32 ACP and .380 ACP called the LWS .32 and LWS .380, respectively. I own each, and a .25 ACP model, too (alas, the .25 ACP model is no longer in production). My review of these guns follows. Seecamp pistols are double-action-only, flush-hammer fired, fixed barrel, retarded blowback semiautos built on a stainless steel frame with a stainless steel slide. They’re manufactured without sights (which can snag) because they are designed to point-shoot at bad-breath distances for self defense. The gun also features a passive magazine safety: You can’t fire the gun by pulling the trigger or retract the slide far enough for a feed cycle unless the magazine is in place. Seecamp’s pistols are the same size in all three calibers. Total weight of each of these pistols loaded measures approximately 13.5 oz. The external measurements: 4.25″ long, 3.25″ tall and .725 inches wide (i.e., the slide). Disassembly for cleaning is easy and clearly described in the owner’s manual. You can download a copy from the Seecamp Web site by clicking here. The Seecamp LWS .32 California Edition, from the right. 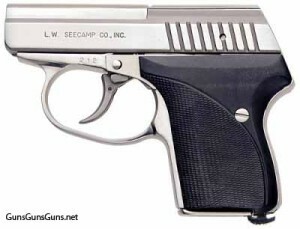 Larry Seecamp, the company’s co-founder and president, created this pistol design along with his late father. He says all of its internal components are hand fit, and that although it’s manufactured in a state-of-the-art machine shop, every copy spends more time during the manufacturing process in the hands of a highly trained, dedicated gunsmith than it does on an automated assembly line. Seecamp says each pistol is tested rigorously at every phase in the manufacturing process and is exhaustively fired and tested for function and reliability. He personally hand tests every copy during its production before it’s deemed ready for shipment. Every pistol comes with a lifetime warranty. The LWS .25 will feed full metal jacket, lead tipped and hollowpoint ammunition, but both the LWS .32 and the LWS .380 are designed around hollowpoint ammunition. My favorite ammunition for my Seecamp .32 pistols (also recommended by Larry Seecamp) is Speer Gold Dot, Federal Hydra Shok, Winchester Silvertip, and Hornady 60 grain XTP. For my Seecamp .380, (also recommended by Larry Seecamp) it’s Speer Gold Dot, Remington Golden Saber, and Winchester Silvertip. Every member of my Seecamp family has performed faithfully in each of its many past trips to the range, but for this article I packed my three LWS .32s and my one LWS .380 for another test session at the range using Birchwood Casey 8″ Bull’s-Eye Shoot N C paster targets. With my LWS .380, I went through a box of fifty 85-grain Winchester Silvertips. My gun fired every round flawlessly. Shooting with a two-handed grip and aiming for the bull’s-eye, I ran three magazines through the little .380 at 10 yards. I was able to put all 18 rounds onto the target, six of them landing within the 8 and 9 rings, and three landing on the bullseye. Recoil was noticeable, but very manageable. Also shooting with a two-handed grip, I ran two magazines at 7 yards and one magazine at 5 yards and produced tighter groups. With 14 rounds left, I did the remainder of my shooting with my LWS .380 at 3 yards and in (6 feet and 4 feet) using one hand. Rapid fire, one-handed point shooting sent all rounds onto the target. My trigger finger was just fine after shooting. 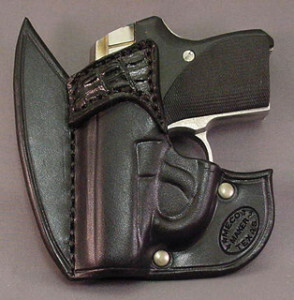 The author’s Seecamp in a Meco rear pocket holster. The author’s Seecamp in Meco’s Batman front pocket holster. With 60 rounds of .32 ACP 60-grain Speer Gold Dot hollowpoints, I ran 20 rounds through each of my LWS .32s and experienced flawless performance. Recoil was noticeably less than with the LWS .380. Consequently, I felt bolder and shot faster, and my groupings were about the same as with the .380 on the Shoot N C targets. An additional 20 rounds of Fiocchi 60-grain lead-tipped hollowpoints also performed flawlessly. Accuracy was about the same. All three LWS .32s were easy and pleasant to shoot. Surprisingly for such small pistols, they’re actually fun to shoot! (Bonus: This makes it more likely you’ll practice with your personal defense tool.) They feature a trigger that’s smooth and even, with a clean break and no over-travel. 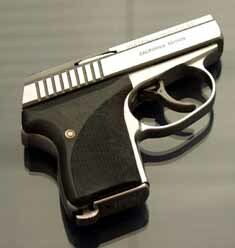 Both are highly controllable and accurate, and for the tiny guns that they are, they fit most willing hands quite well. 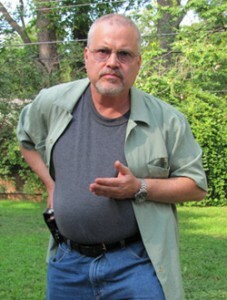 Robert Locke of San Antonio, Texas, owns Meco Pocket Holsters. I have two, and they keep my Seecamp straight up in my pocket and discreetly concealed. These holsters don’t print, and perhaps most important, they remain in your pocket when you draw your gun. The front “wing” onthe Meco Batman holster helps to keep the rig in the pocket, and the wallet flap on the back pocket holster that disguises the little pistol’s outline. My Seecamps and also enjoy traveling in Jim Surrusco’s Hidden Pocket Holsters. 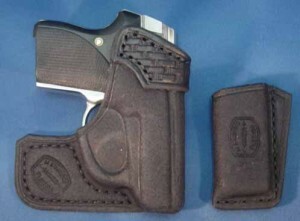 Surrusco’s back pocket holster and rough out holster with thumb push off are light, unobtrusive and work great. They’re also very pretty—too bad they’re hidden! 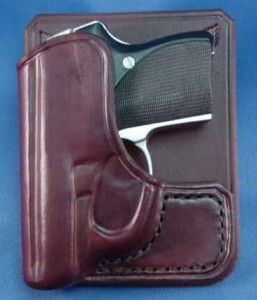 The author’s Seecamp in Surrusco’s back pocket holster. 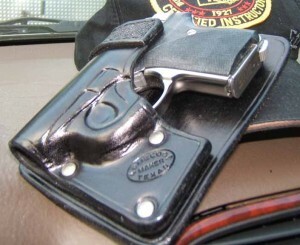 The author’s Seecamp in Surrusco’s front pocket holster. Seecamp are meant to be used up close and personal, which is where the majority of close encounters of the worst kind occur. Nevertheless, Seecamps in all three calibers produce respectable groups at up to 7 yards, which is way beyond the distance at which the majority of deadly attacks occur. The LWS .380 is one of the smallest .380 ACP semiautos on the market, and the LWS .32 is one of the smallest .32 ACP semiautos on the market. Despite this, all of my Seecamps are natural pointers and fit my medium-sized hand just fine, making them an excellent choice for pocket carry. Bottom line: These Seecamps are truly great pistols that come in a small package. Bruce N. Eimer, Ph.D., is a practicing licensed psychologist, a Pennsylvania State Police Certified Law Enforcement Firearms Instructor and an NRA Certified Law Enforcement Firearms Instructor who advocates for responsible gun ownership and thorough gun education. He is the founder and president of Personal Defense Solutions, LLC, a professional firearms training company in the Philadelphia area that offers non-resident multi-state concealed gun permit classes and private firearm instruction sessions as described at PersonalDefenseSolutions.net. Dr. Eimer also qualifies retired police officers to carry concealed firearms under HR 218, which is the Law Enforcement Officers Safety Act (for more information, go to RetiredPoliceCCW.com). And he writes a blog at ConcealedCarryLaw.com and runs the online forum DefensiveHandguns.com. This entry was posted in .32 ACP, $251-$500, $501-$750, Seecamp, Semiauto, Subcompact and tagged Handgun Reviews on July 12, 2010 by Bruce Eimer.